Kim Jordan toured the world as Gil Scott-Heron’s Musical Director for more than three decades, until his untimely death in 2011. You’ll find Kim on many of Gil’s albums, including; ‘Spirits’ ‘Tales of the Amnesia Express’ and Gil’s last album ‘I’m new here.’ Kim pays homage to Scott-Heron’s legacy by “Remembering Gil” with this special tribute concert. Spoken word artist Malik Al Nasir (band leader of Malik & The O.G’s) was Gil’s protégé from 1984 until his death. 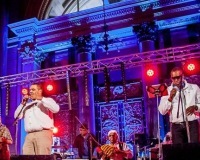 Malik conceived the concept for “The Revolution Will Be Live” whilst at Gil’s funeral in NYC and has produced sold out showcase performances in Liverpool, Toronto and Ottawa Canada - since it was selected to open Liverpool International Music Festival 2015, at the prestigious St Georges Hall. That year he also released his debut double album ‘Rhythms of the Diaspora Vol’s 1 & 2 Ft. Gil Scott-Heron & The Last Poets’ on Mentis Records. Kim’s tribute has toured the USA playing NYC, DC, Detroit and Vegas, as well as a London debut earlier this year. Both Kim and Malik spent years touring with Gil and are committed to ensuring that his musical and spoken word activist legacy lives on and as such, have brought both of their unique tributes together, for this very special showcase of “The Revolution will be Live!” Kim’s set highlights Gil’s best-known hits, which spoke to the relevant issues of the past, yet continue to address the social ills of today. Whilst Malik & The O.G’s set, is a Gil Scott-Heron and Last Poets inspired mix of original spoken word and song, addressing some of the contemporary issues of freedom, liberty and social injustice. Both sets represent a part of Gils artistic legacy - direct from the source. In May of 2015 ‘Remembering Gil’ had its USA debut at THEARC Theater in Washington D.C, (Where Gil had lived for many years and drew many band members from). The show has continued to play to sell-out audiences across the East Coast - including the Bethesda Blues and Jazz Club in the Washington Metropolitan area in November 2016 and on April 1st, 2017 at SOB’s (Sounds of Brazil) in NYC. The NYC performance was a highlight moment, as it was held on what would have been Gil’s 69th Birthday. The 2017 US tour continued with performances in Las Vegas, Detroit, New Orleans and Houston Texas.